Located in Dallas, Texas, the most prominent and recognizable feature of Thanks-Giving Square is the Chapel of Thanksgiving, a small, spiral tower that features an enclave for prayerful thanks. The entrance to the chapel is at the end of a 125-foot bridge that runs over a cascading waterfall. Inside the chapel, the spiral is topped with stained glass "Glory Window", one of largest horizontally mounted stained-glass pieces in the world. 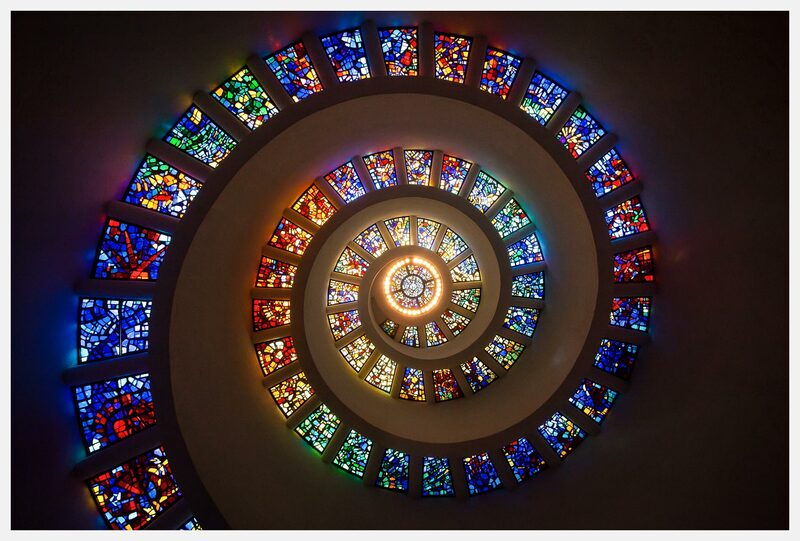 The window was designed by Gabriel Loire of Chartres, France to feature brighter colors as the spiral reached its apex, becoming brighter as it reaches the center. The etched glass window "The Spirit of Thanksgiving," designed by glass engraver John Hutton, features a dove over the doorway.